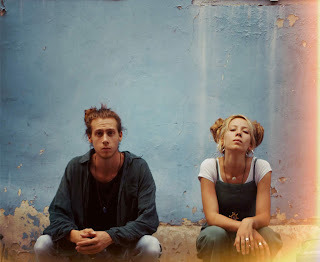 Brother and sister duo Kayam have a chilled out sound but don’t mistake that for a lack of energy or passion. New single ‘Ground’ starts as a mellow strum along but it builds slowly, almost unnoticeably in to a song full of joy and positive energy. The acoustic notes are joined by a simple beat, then some lead guitar, a bass line appears, the vocals move from a mumble to more assured delivery and then there are harmonies. The video backs this all up as the continuous shot of a growing crowd of cold looking dancers and performers start to appear, loosely following something approaching a dance routine. This whole thing has the feel of a project put together in a day with friends but it is all the more joyful and fresh because of it.